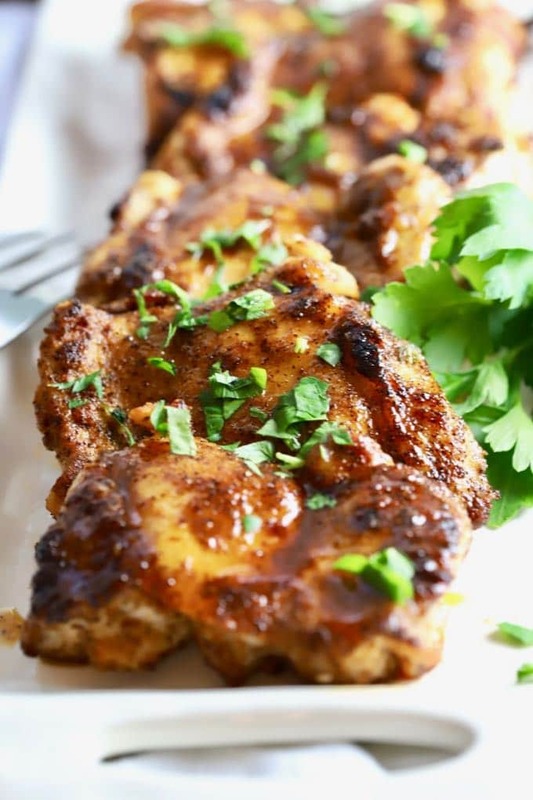 Broiled Chili-Rubbed Chicken Thighs with my spicy chili-powder based chicken thigh rub are a quick and easy, healthy, and tasty low-carb, 15-minute wonder! Have I got a great light and healthy recipe for you today! 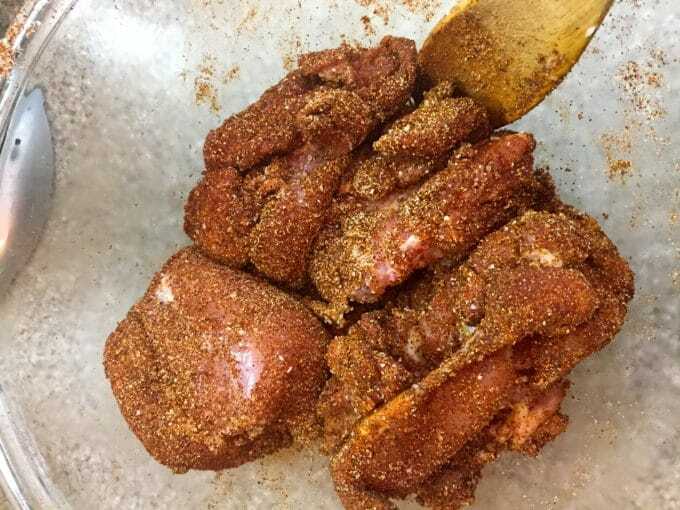 My Broiled Chili-Rubbed Chicken Thighs recipe is a delicious, easy and quick way to answer the age-old “What’s for dinner tonight?” question. 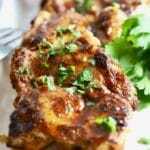 Always popular at my house and paired with a side dish and a salad, these sumptuous, juicy, sweet and spicy chicken thighs are sure to please even your pickiest eaters. And, the best part is they are only 207 calories each! Plus, they only take 15 minutes to make, which means you can have them on the table in record time. 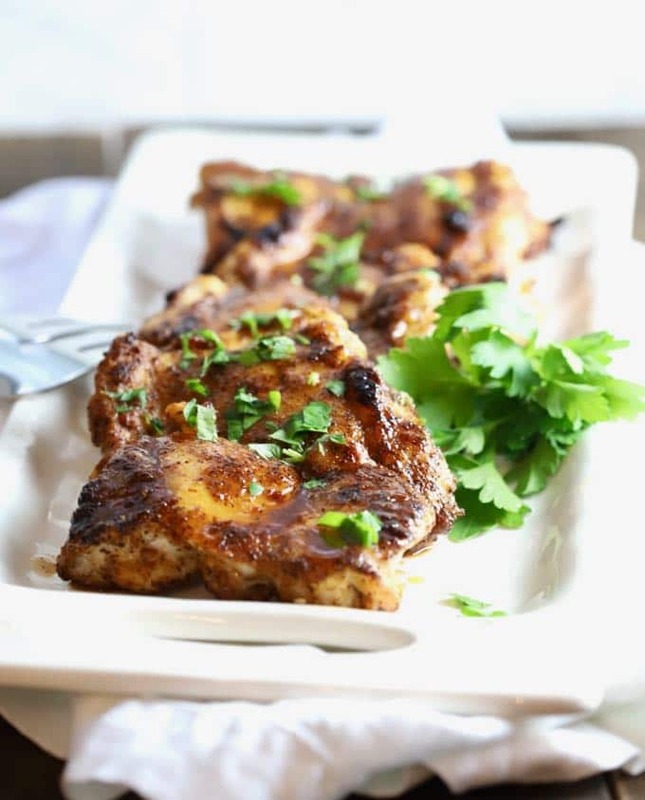 Made with boneless, skinless chicken thighs, Broiled Chili-Rubbed Chicken Thighs are also delicious the next day cold or warmed up and cut up, and can bring new life to even the most boring salad. Are you like my husband and not a fan of dark meat or chicken thighs? Just swap them out for chicken breasts, and you will be in business. No muss, no fuss! 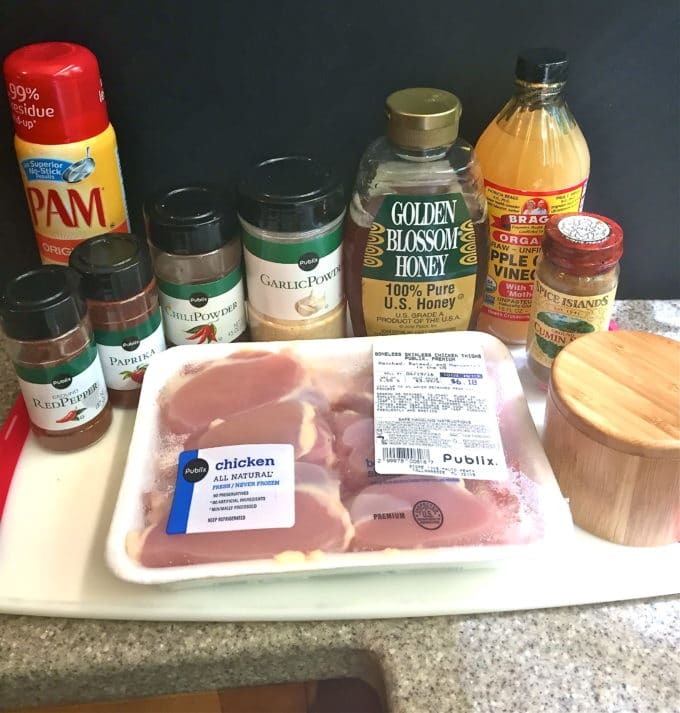 What to serve with Broiled Chili-Rubbed Chicken Thighs? If you need more ideas for sides, check out all of my side dish recipes here! 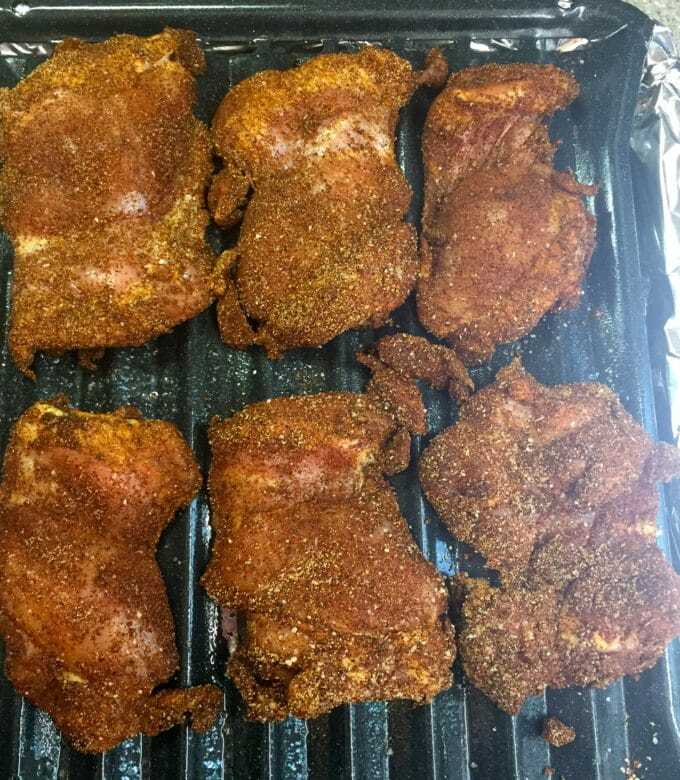 To make these yummy crispy chicken thighs, gather the ingredients which are: chicken thighs, garlic powder, chili powder, ground cumin, kosher salt, paprika, ground red pepper, honey, and apple cider vinegar. To make clean-up a breeze, you will also need some non-stick cooking spray and aluminum foil. Preparation is easy. Begin by turning your broiler on. 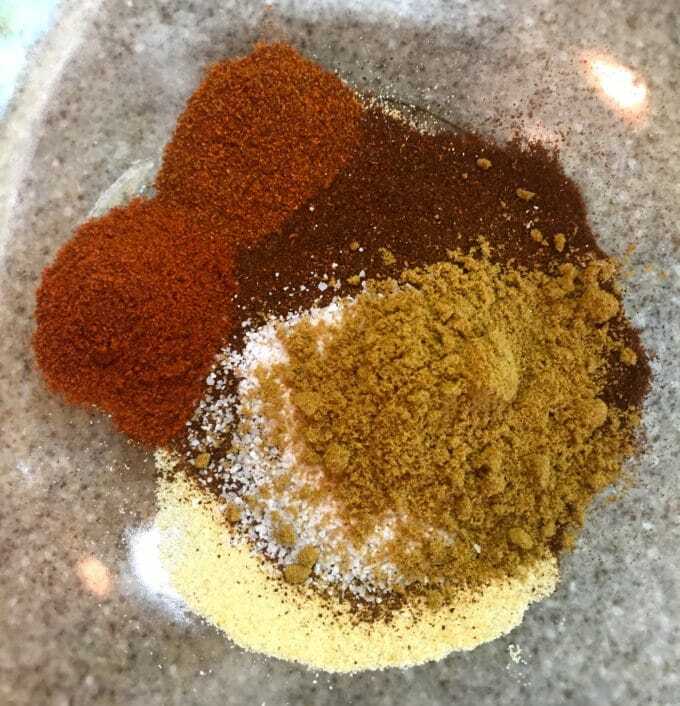 Add garlic powder, chili powder, cumin, paprika, salt, and red pepper to a large bowl and mix well. Add the chicken thighs and mix well, making sure the thighs are coated with the spice mixture. 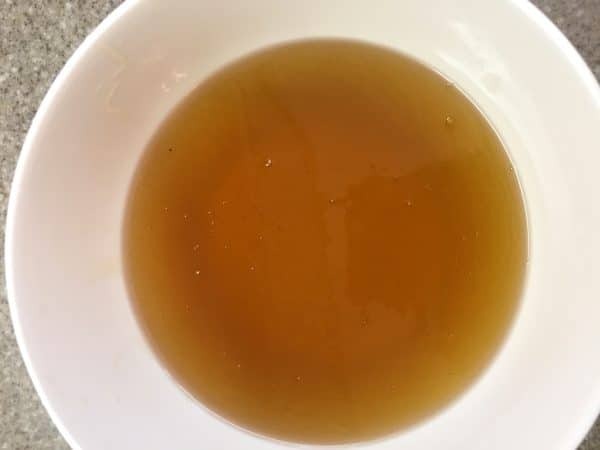 Combine the honey and apple cider vinegar in a small bowl and set aside. Line the bottom of your broiler pan with aluminum foil. When the oven is hot, place the chicken pieces on the top piece of a broiler pan which has been sprayed with non-stick cooking spray. Place the broiler pan on the bottom shelf in your oven or at least 10 inches from the broiler element. Broil the chicken for 5 minutes. Remove the pan from the oven and turn the chicken over. Broil for 5 minutes more. Remove the pan again and brush the chicken with 1/2 of the honey-vinegar mixture. Broil 1 minute. Remove the pan one more time, turn the chicken over, and brush the chicken with the remainder of the honey-vinegar mixture. Broil 1 additional minute. That’s it! Remove the pan from the oven and serve the Broiled Chili-Rubbed Chicken Thighs immediately. *This recipe was originally published May 9, 2016. I am republishing it September 5, 2018, with new photos, simplified instructions, and tips. The basic recipe remains the same. If you don’t have a broiler pan, simply use a rimmed baking sheet fitted with a wire cooling rack. 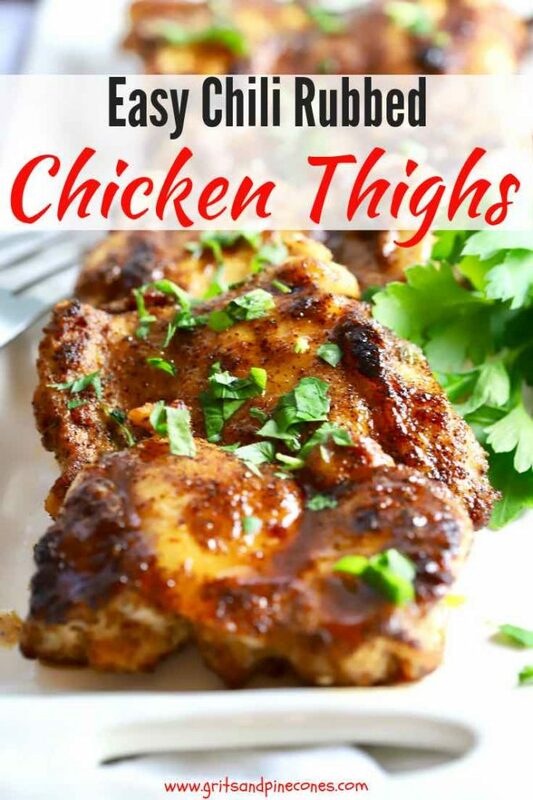 You can substitute boneless, skinless chicken breast for the chicken thighs. If they are large, cut them in half horizontally so they will cook evenly. If you would like to serve wine with this meal, as a general rule, white meat pairs well with white wines like Sauvignon Blanc or Chardonnay, while dark meat is best served with medium-bodied red wines such as Pinot Noir or Zinfandel. Cheers! Turn your broiler on to high. Add garlic powder, chili powder, cumin, paprika, salt and red pepper to a large bowl and mix well. Add the chicken thighs and mix to coat the chicken with the spice mixture. Set aside. Place the broiler pan on the bottom shelf in your oven or at least 10 inches from the broiler element. Broil the chicken for 5 minutes. Remove the pan from the oven and turn the chicken over. Broil for 5 minutes more. Remove the pan from the oven and turn the chicken over. Broil for 5 minutes more. Remove the pan again and brush the chicken with 1/2 of the honey-vinegar mixture. Broil 1 minute. Remove the pan again, turn the chicken over, and brush the chicken with the remainder of the honey-vinegar mixture. Broil 1 additional minute. Remove the pan from the oven and serve immediately. Enjoy! If you don't have a broiler pan, simply use a rimmed baking sheet fitted with a wire cooling rack. I had been wondering what to do with a frozen package of boneless skinless chicken thighs for some time. I had never cooked them before, choosing breasts always in the past. But I couldn’t pass up a Fresh Market sale. This recipe sounded tasty, and we both agreed that it was great. Actually, the most time-consuming part was trimming the fat off the raw thighs before putting on the rub. I was honestly incredulous that they would cook under the broiler in ten minutes, but our trusty Thermapen confirmed that they had reached the required 165 degrees in that time frame. The honey/vinegar glaze added a nice finishing touch. Thanks, Sharon, for another great one! Hi Susan, so glad you guys liked the recipe and thanks so much for letting me know! I like the seasonings in this recipe. Could you use them with regular bone-in chicken thighs with the skin on and still broil them, or maybe bake instead of broil? Hi Linda, yes, the seasonings can be used with regular bone-in chicken thighs with the skin on without any problem. You might have to increase the broiling time just a bit because bone-in chicken takes longer to cook. To be on the safe side, you might want to use an instant meat thermometer to make sure your thighs are at 165 degrees F. which is the safe temperature for chicken. For this recipe, I recommend broiling them, although I haven’t tried baking them. Good luck and please let me know how it turns out!